Our Earth is the greatest phenomenon that I can think of!!!! miracles and moments of beauty! moments of ingenuity and imagination, as well!!! to come back to see this growing collection! This project is the result of an ambitious initiative taken in the late 1990s by Lélia Deluiz Wanick Salgado and Sebastião Salgado. Confronting environmental devastation in and around a former cattle ranch bought from Sebastião Salgado’s family near the town of Aimorés, in Brazil’s state of Minas Gerais, they decided to return the property to its natural state of subtropical rainforest. They recruited partners, raised funds and, in April 1998, they founded the Instituto Terra, an environmental organization dedicated to the sustainable development of the Valley of the River Doce. Since then, the couple’s dream has already borne much fruit. 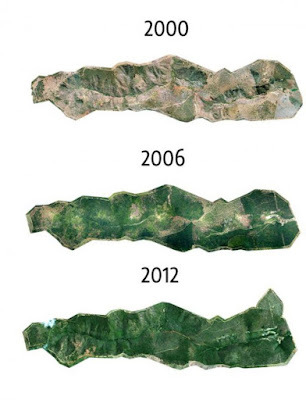 Thanks to the work of the Instituto Terra, which has now been declared a Private Natural Heritage Reserve (PNHR), some 17,000 acres of deforested and badly eroded land in a broad stretch of the Valley of the River Doce have undergone a remarkable metamorphosis. More than four million seedlings of the multiple species native to Brazil's Atlantic Forest have been raised in the institute’s own nursery. 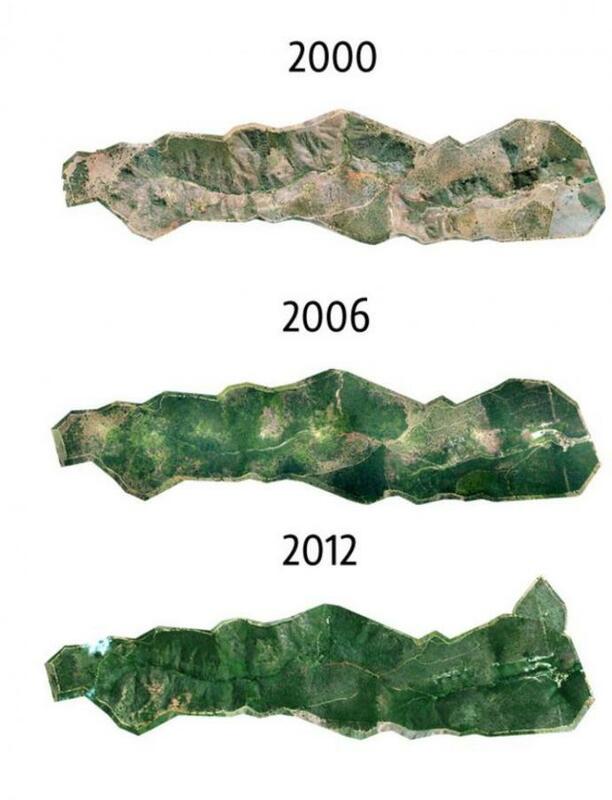 Those plants are now reforesting what was long known as the Salgado family’s Fazenda Bulcão, or Bulcão Farm, and are also contributing to similar environmental restoration programs in surrounding areas. 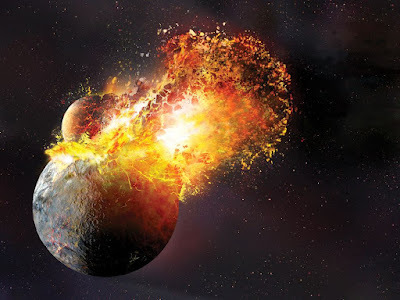 Around 4.5 billion years ago (give or take a few centuries), while the Earth was still forming, another smaller planet named Theia collided with our soon to be planet! It was quite a spectacular event!! Debris flew everywhere and then, very slowly – over the course of another few million years, the Earth’s gravitational pull helped to reform Theia into our moon. This collision caused the Earth’s axis to shift to a delightful 23.5 degrees and this event set the stage for life to begin on our planet. This miraculous realignment of our axis is the reason why we have four seasons in many parts of the world. 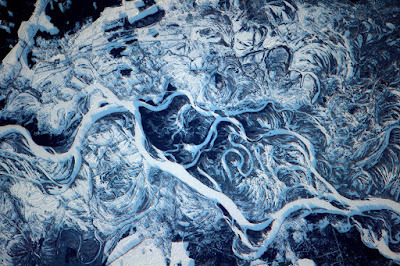 The Frozen Wild Dnieper River - Curling snow drifts are magnified by the terrain around the 1,400 mile Dnieper River, flowing from Russia to the Black Sea in this image from the International Space Station on Feb. 9th, 2017. A Building That Eats Smog! A new construction material could make the concrete jungle function a bit more like a natural one. 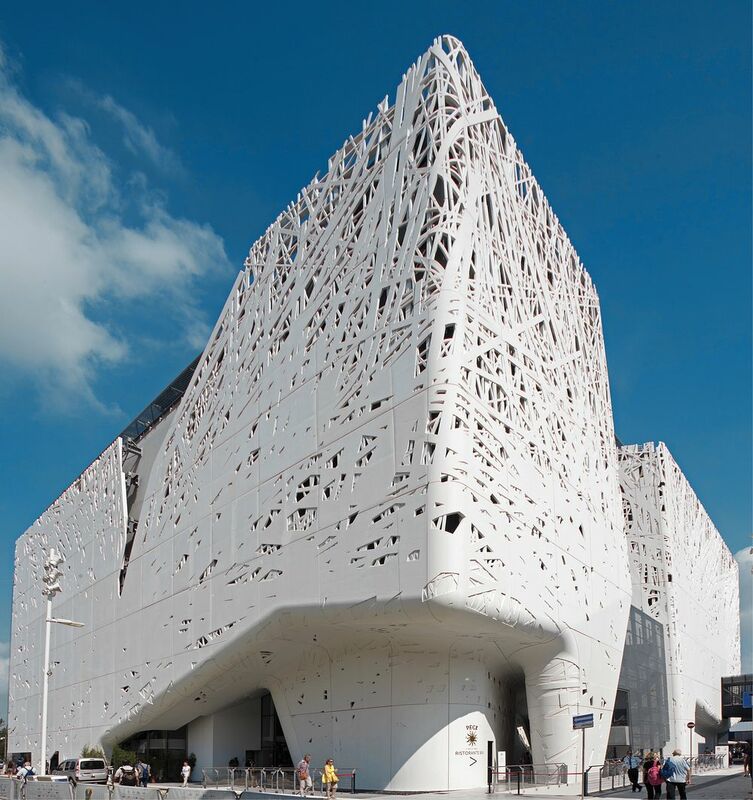 Palazzo Italia, which debuted at the 2015 World’s Fair in Milan, is the first building made of concrete that’s designed to clear the air. The facade, a mixture of cement and titanium dioxide, captures nitrogen-oxide pollution and converts it into a harmless salt that easily rinses off the walls when it rains!! 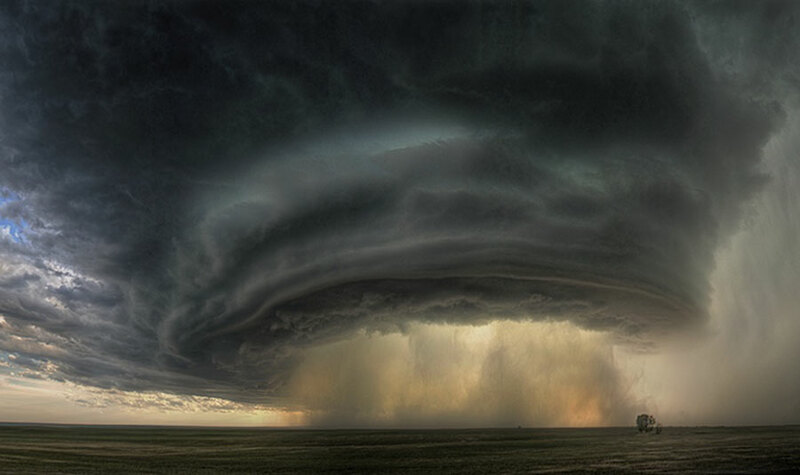 This impressive thunderstorm cloud is called a supercell. Such colossal storm systems center on mesocyclones -- rotating updrafts that can span several kilometers and deliver torrential rain and high winds including tornadoes. Jagged sculptured clouds adorn the supercell's edge, while wind swept dust and rain dominate the center. A tree waits patiently in the foreground. The above supercell cloud was photographed just west of Glasgow, Montana, USA, caused minor damage, and lasted several hours before moving on. 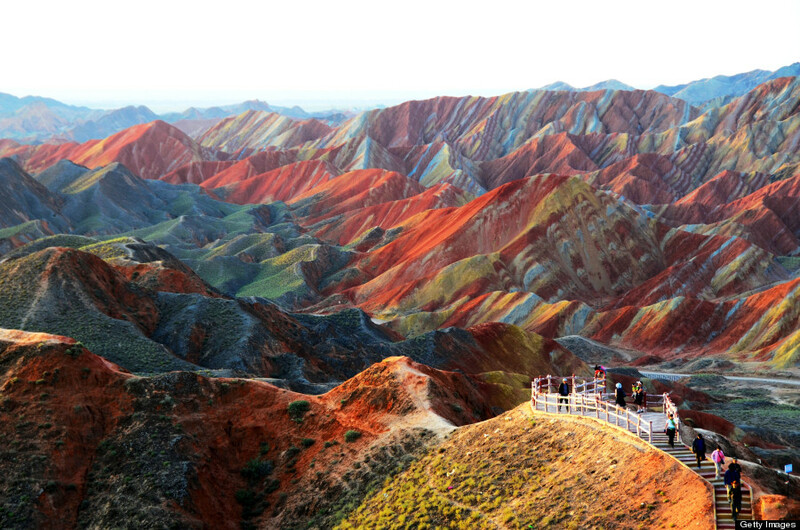 The “Rainbow Mountains”, part of the Zhangye Danxia Landform Geological Park in the Chinese province of Gansu, are one of the most unique geological landforms on Earth. Over millions of years, layers of different colored sandstone and other minerals slowly formed on top of one another. Then, about 40-50 million years ago, plate tectonics kicked in. You see, India actually used to be an island, until its tectonic plate began to collide with the Eurasian plate, upon which the main continent of Asia sits. The Indian plate crushed itself into the Eurasian plate at a rate of about 27 feet every hundred years. This may not seem very fast, but when you consider the sheer size of the Indian tectonic plate, it’s easy to see how this collision made some major changes to the landscape. The collision (which is responsible for creating the Himalayas) also buckled and crumpled the layered mountains in Gansu.